If you’ve ever wanted to fancy-up fresh summer fruit without much fuss, this is your solution. 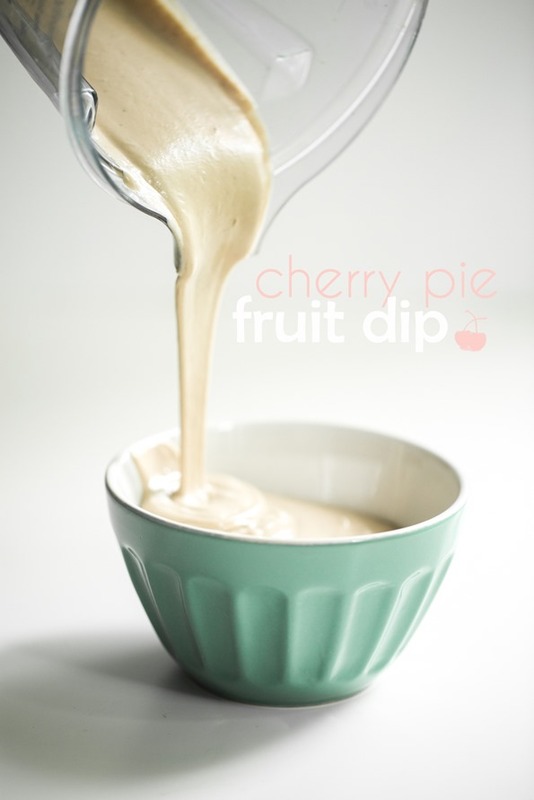 This dip is creamy and luxurious with a hint of cherry-vanilla flavour. 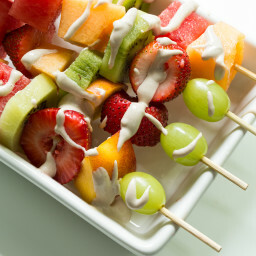 Throw some fruit onto a kabob for a special event or just drizzle it onto a bowl of fruit for a quicker option. Heck, it’s even great drizzled on granola and yogurt, pancakes, and fruit crisps. You can’t go wrong if you tried! I blended soaked cashews with almond milk, cherries, vanilla, and coconut syrup creating a decadent, lightly-sweetened dip free of dairy. Eric went crazy over this dip and he isn’t even a dip person, so there you go. You will probably have to hide it. Sunday evening, we emptied our kitchen cupboards to prepare for the kitchen reno. The dishes, gadgets, glasses, appliances, and food now have a home in our previously empty dining room. 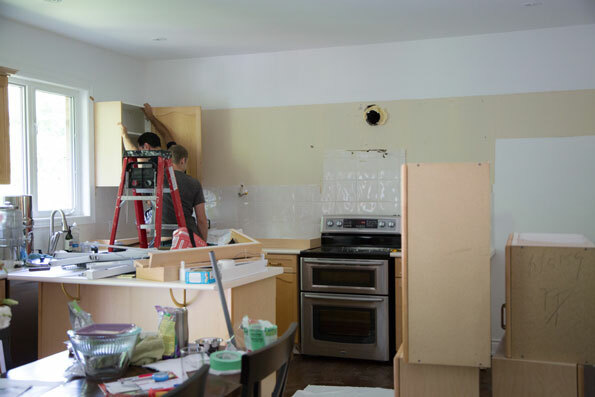 On Monday, Eric and our friend Pete started to take the kitchen cabinets apart. Several hours later the kitchen was empty! I’m saying goodbye to a working sink, oven, counter tops, and dishwasher for the next month and a half or so. So far the biggest “emergency” has been my missing dark chocolate stash (the horrors! ), so I can’t complain too much. 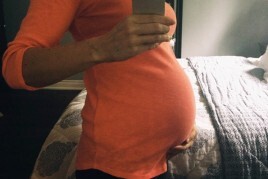 But have you ever seen a 31-week pregnant lady riffling through boxes to find her chocolate? It wasn’t my proudest moment. So here we have it – an almost blank slate. The sad, beige tiles will be ripped off today and the electrical work starts tomorrow. I created a new Instagram account for non-food related things (like renos, life stuff, pregnancy, etc) so you can follow along @theglowspot if you’d like to see updates! The creamiest non-dairy fruit dip ever! Soaked raw cashews form the base of this creamy, lightly sweet dip. Drizzle it on fresh fruit, oatmeal, fruit crumbles, pancakes, waffles, and more. Place the cashews in a bowl and cover with an inch of water. Soak overnight or for at least 8 hours. If using a Vitamix you can get away with soaking for only 2-3 hours. Drain and rinse the cashews thoroughly. Add the almond milk into the blender followed by the drained and rinsed cashews, pitted cherries, vanilla, and sweetener. Blend on low and increase the speed gradually until blending at full speed. Keep blending until the mixture is velvety smooth and doesn’t have any texture to it. You can add a splash more milk if you need to help the blender along. Chill the fruit dip for a few hours (or overnight) for the best flavour, but you can also enjoy it right away if desired. 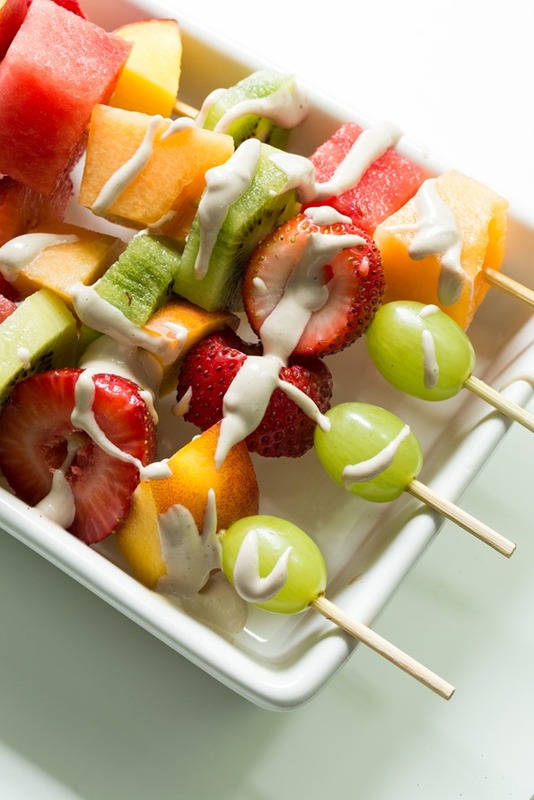 Prepare the fruit kabobs (if making) or simply drizzle the fruit dip over a bowl of fruit. The fruit dip will keep in a sealed container in the fridge for about 1-1.5 weeks, possibly longer. Nutritional info is based on dip only. Tip: For a nut-free fruit dip option, try making coconut whipped cream instead. 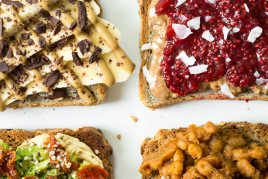 You can mix a bit of chia seed jam into it for a similar fruity effect. And, I’m totally jealous of the kitchen reno. When we bought out house two years ago I said oh yeah this kitchen is gonna be the first thing to go. Two, years later….and I still have a love/hate with it. One day I’ll get my new kitchen. Good luck with the new kitchen! I love summer fruit! Yum! I bet this dip would be great with almond extract instead or in addition to vanilla. I love fruit dip but it’s really hard to find a good vegan one! I’m definitely giving this a try because I love the cherry twist! The title alone makes me so hungry! I love the way this sounds! So perfect for these hot days we are having! : ) Can’t wait to see the kitchen when it’s all done! 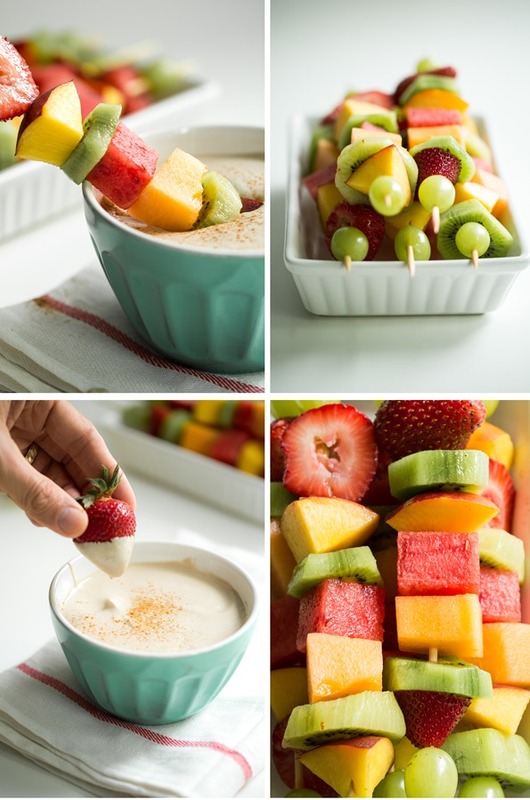 Those fruit Kabobs looks amazing and would make the perfect snack! We redid our kitchen after we moved in ten years ago and it totally changed our lives. Well more specifically my wife’s life. It became her favorite room in the house. When we moved in there were remnants of mouse poop and mouths and it just had to get done. It’s worth the inconvenience in the end. I don’t think we need to worry about how long the kabobs will last in the fridge because things in this house get eaten in a day! This looks like so much fun to eat! Obsessed with this vegan recipe! Love the idea of blending cashews and almond milk together to make a creamy puree! Great idea…especially good for my cherries that are getting a bit mushy! wow, thats such a unique recipe, I have never thought of making a fruit dip…especially one sans chocolate and/or caramel and all the stuff we try not to eat all the time! This is so indulgent free but looks so delicious! Thanks! Let me know if you try it out…it’s honestly good poured over just about anything! I kept finding new things to pour it on, hah. Thanks for your kind words btw! Yum, this looks so delicious! I’m surprised that the cherry doesn’t color the dip at all. I made this with frozen cherries (can’t stop eating the fresh ones long enough to cook with them) and it came out a bit pinker. Not sure why that made a difference but it seemed to. Oh good luck on all the renovations before the baby comes!! This dip looks so rich and creamy and the colors are so bright! Yum! I love fruit dips because I’m so into fresh fruit nowadays and they make it feel really dessert-y! This comment has nothing to do with your marvelous looking dip and fruit platter, and perhaps you know this already. I was rushing through the Rideau Chapters store in Ottawa on an emergency book buying spree when I noticed a very prominent table labelled “The Best Books of 2014–So Far.” Your Oh She Glows Cookbook was prominently displayed. I am not sure if each store decides the line up for the distinction, or if the same books show up in all stores, but I thought you would like to know. Congratulations! You will survive the renovation. We went subterranean for five months, living in the basement with a rigged up shower over the laundry room floor drain, a bar fridge and a hotplate to keep us going. And did I mention my two adult children were toughing it out down their with us? The renovations were all worth it. I continue to say, “I love my kitchen!” out loud to myself at least once a week. Hey Nan, Was that in Indigo/Chapters? My cookbook is still the best selling cookbook in the country 4 months running. Crazy, right? I’m so happy to hear they had it on a special table in the store! Yes! That would indeed be Indigo/Chapters. Our “historic” sign on the storefront continues on as Chapters. Terrific news on your lofty book sales! Awesome, they have been such a big support for the book! This is such a fun recipe, I love it! Good luck with the kitchen renos, I can’t imagine not having a kitchen! This sounds delightful! Love those kebabs! This dip sounds amazing. Cherry and vanilla?! yummmmm… Good luck on the kitchen renovations!! This dip looks amazing! I can imagine it being the perfect fruit, creamy and sweet combo – LOVE it! 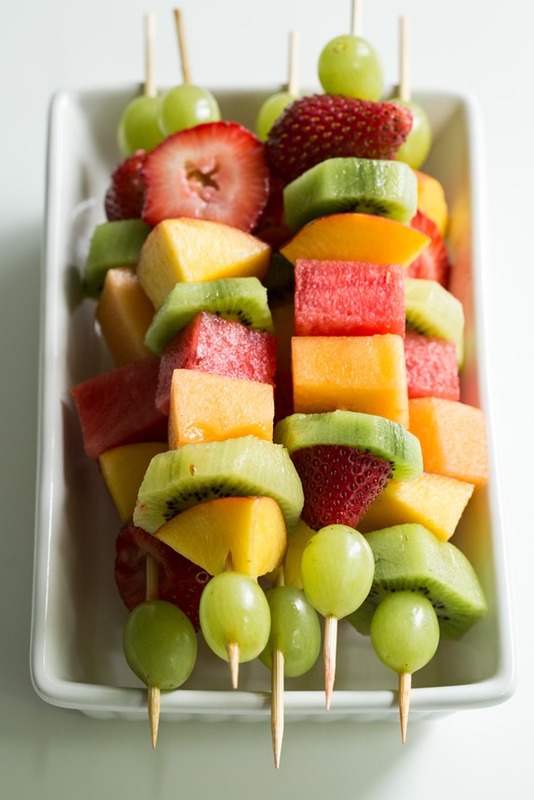 And your fruit skewers just look perfect! Such a great idea. I loved cherry vanilla soda when I was a kid :) Great flavor combo. 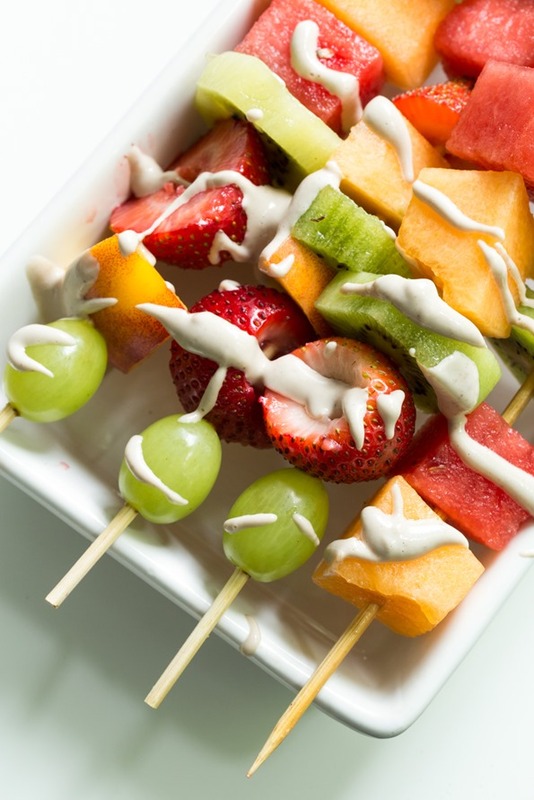 I eat fruit salad every day but this makes me want to break out the skewers…perhaps I will! Good luck on the kitchen reno! Can’t wait to see more pics! Looks delicious; a perfect addition to the wonderful summer fruit. Good luck on your kitchen! I hope your reno goes super fast and issue-free! In the meantime, I’ll be eating fruit kabobs like it’s going out of style! Love! This dip looks incredible! The possibilities really are endless. Good luck with the new kitchen renovations! I’m sure it’s a little stressful to deal with, especially when you can’t find your chocolate stash. ;) I can’t wait to see how the finished product turns out! 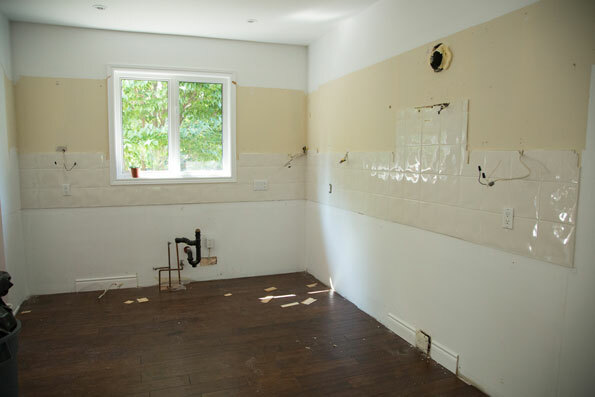 You are lucky to be doing the reno in the summer time! We did the same thing and the grill was our best friend for 2 months. We grilled anything and everything we could think of, ha! I even got really desperate and started baking in my slow cooker…a girl’s gotta do what a girl’s gotta do! I’m sure we will too…Eric is already talking pizza on the grill. I can’t wait! This looks delish:)! I have a hard time digesting cashews, though. . . Do you know if there are any other nuts this might work with? Love your blog . . . Thanks for all the great recipes:). almonds might work or macadamia nuts but I’m not sure if the almonds would get as smooth. You might need to play around with the milk ratio! As if our simple food choices didn’t get enough criticism- being beautifully swollen with baby AND eating ‘that way’ seems to give strangers a whole new reason to criticize. Thanks for being another healthy, thriving example of a mama who is doing great things. 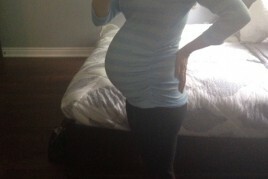 Three cheers for vegan pregnancy! Hip hip hooray!! Hooray!! Hooray!! Oh goodness, I could sure use some of that dip right now! I love how it’s so easy to make and it looks delicious! Good luck with your kitchen renovations! Love the idea of fruit kebab-style! Looks so beautiful and summery!! What an cool idea for a dip to go with fruit! Looks delicious! Delicious! I just made it and it’s very nummy…however, my version (using the recipe) was purple in color due to the cherries I’m sure. Curious if I missed something and how your lovely dip is so light in color. Hi Eve, I think it just depends on the hue of the cherries and whether fresh or frozen were used. Some cherries are really dark purple while others are a bit lighter. glad you enjoyed it! I don’t think I’ve ever seen fruit dressed so simply yet so glamorously. So beautiful. Thanks. Just saw that u are recommended by Dr Sara Gottfried via her “Genius Bar” emails. Yay you! Love your site and book. Fruit kebabs somehow make already delicious fruit taste even better! Very excited to try this dip! I’m loving cherries right now. I may add some almond extract along with the vanilla because I enjoy the cherry/almond combo so much. Mmmmm. these look seriously delicious and so perfect for summer! definitely craving one right now! I have never tasted a nut based dip before. it looks delicious. Hi Angela! I’m a high school cross country runner and I’m struggling with what to eat before and after my workouts so I don’t feel sick, but don’t overdo it. Someone told me that fat was bad to eat before? I think you’ve done a post about the kinds of foods to eat after, but I was just wondering if you maybe have a recipe that I could try? Thank you so much! Your journey has been such an inspiration to me. I struggled with anorexia, overeating, and exercise abuse in freshman year. I’m still learning to have a healthy relationship with food and cooking with you has helped so much! I want to be like you and get my PhD in psychology! I hope you have a great day today! God bless! I just made this and mine turned out pink. Did you use yellow cherries when you made yours? Regardless, it is very yummy! This looks wonderful, great creation for fresh summer fruit – thanks! And exciting on the kitchen reno! Oh no! I can’t imagine being without a kitchen for so long! Good thinking though on getting it done before baby arrives :D I made this dip for my kids and they adored it! Thanks for such a great recipe! Hmm, I guess kabobs make a good entertaining idea, but if its up to me I rather get all messy like a kid and just roll the fruit around in the dip and pop it in my mouth. Just me! This looks amazing, but I am highly allergic to cashews :(. Oddly enough I can have almonds, walnuts, pecans, and peanuts! 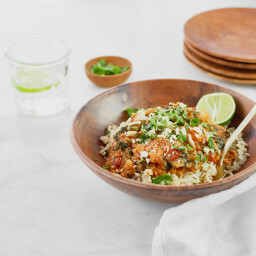 Any alternatives to the cashews in this recipe? Angela, you may have been asked this a bazillion times, but can you use roasted cashews instead of raw, as they are much more affordable. Roasted cashews will not get as creamy when soaked and will not blend up as smooth. They will also make anything you use them in taste strongly of cashews; raw cashews used to make “creams” and sauces impart almost no nut flavor, just a rich creaminess which emulates dairy based food textures and comes close in taste. You can pick up raw cashews from bulk bins for a reasonable price and than can buy only the amount you need for the recipe. Don’t use salted nuts, whatever you decide. Good luck! I was initially disappointed when I couldn’t find cherries at the grocery store, but I made the dip with blueberries instead, and it was delicious, especially with milder tasting fruit, like bananas and grapes. Will definitely be making this again! Have I lost my mind? A couple of weeks ago, I saw a neat recipe for little chocolate banana bites on sticks and I wrote down that it was from your website but now I can’t find it! Don’t know why I didn’t bookmark it! Can you help? Oh gosh this looks heavenly! So simple and healthy… I usually prefer veggies to fruit but I think this may be a game changer for me. Thank you Angela! When we were moving my sister into her college dorm/apartment, I stumbled upon your cookbook and couldn’t help but look through its pages filled with delicious-looking pictures! Your website is just as good as your book; I love how your recipes make it possible to eat delicious *and* healthy food! I’ve made this twice now and was blown away by yumminess both times! The second time I used the half the milk and subbed 1/4 cup unsweetened tart cherry juice for a stronger cherry flavor and more intense color. It was better the way Angela wrote the recipe, but we enjoyed the extra zing from the juice too. Finally! A good, quality fruit dip. I’m not a fan of cherries, however. Is there something else you would recommend in place of that? When you cover the cashews in an inch of water, do you mean an inch ABOVE the cashews or just a general inch? oh my gosh this looks truly amazing. 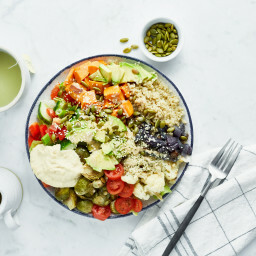 my mother and i are usually vegan on and off but this website certainly makes me want to stay vegan:) lol i want to eat this! I made this with blueberries and agave syrup. It is yummy. Can’t wait to serve it to guests, but I was glad I was alone when I made it so I could lick the utensils clean!